There’s been a crime wave of epic proportions sweeping through the Rose City lately, and its got all of us on edge. This unprecedented streak of criminal activity began with a roving band of chefs swooping into residents’ yards at night and stealing herbs from their gardens. An apartment manager whose complex is located suspiciously close to the trendy restaurants in SE Portland talked to local news affiliate KATU and said, “In some neighborhoods there’s coyotes, some have skunks – here, it’s just sous-chefs and all the things that come with that.” Everything from nettles and catmint to borage, pineapple weed and grape leaves have gone missing. A neighbor reported chasing one off the property with what appeared to be a bag full of chicory leaves. Apparently, these sous chefs even have a certain scent. “Sometimes smells like brisket,” the manager reports. Surely, there’s a way to catch these heathens in the act. Maybe lure them into a trap baited with a little lemon aioli? 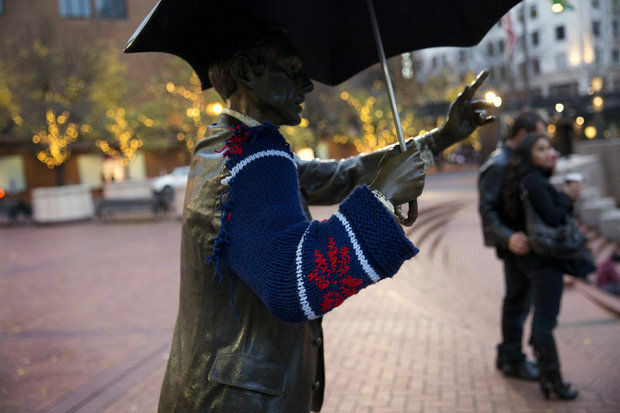 Next, a colorful and festive holiday sweater that had been placed on the iconic umbrella man statue in Pioneer Square was ripped off. Literally: only a sleeve was left of the blue cardigan with red poinsettias, part of a “yarn bombing” project where local fiber artists are decorating city statues with hand knit sweaters. Umbrella man will be getting a new sweater, authorities say, but this one will come from a thrift store. In the meantime, if you happen so see anybody walking down the street wearing a gaudy blue and red holiday sweater with a missing sleeve, call the cops! (If he happens to smell like brisket, call them twice). Half the male population in Portland looks like this. 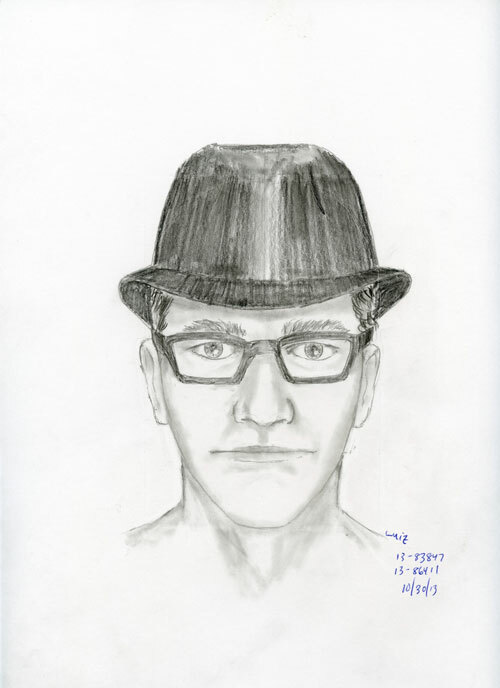 But the coup de grace goes to a man police have dubbed the Nerdy Bandit. The guy, described as “a white male, early 20s to early 30s, 5’8” to 6′ tall, skinny build, brown hair, “nerdyish,” wearing a hat…and black-rimmed glasses” is responsible for holding up two American Apparel stores, before moving on to an Urban Outfitters. Armed with a handgun he has absconded (great word!) with an undisclosed amount of cash from all but one of the stores. In that case, the frightened employee simply ran away from the register, enough to scare off the armed robber. Interesting strategy, that. Marauding sous chefs. Ugly holiday sweater thieves. Nerdy looking armed robbers. I’ll never be able to venture out into my beloved Portland again, without a cold shiver of fear inching its way down my spine. This crime spree serves as a warning: NOBODY IS SAFE OUT THERE. (It also reminds us why our unofficial motto is “Keep Portland Weird.” This type of thing couldn’t possibly happen anywhere else). But if this is what we have to contend with, when other cities are dealing with drive-by shootings and gang activity and murder, then I’ll take my chances with sweater thieves any day. Oh goodness crimes that make you laugh. I really wonder sometimes what goes through peoples heads when they do these things. I feel like the nerdy robber and the sweater thief need to have a hipster ugly sweater christmas party. Maybe this will give them hobbies of the non criminal proportion. Have a great Thanksgiving Mark! I like your idea! That would be a great way for them to channel their anger and come to a peaceful resolution. Unless…maybe the Nerdy Bandit and the sweater thief are one and the same? Perhaps he went into Urban Outfitters, thought the prices were too high so, outraged, robbed the place, and then stole umbrella man’s sweater? It’s a stretch, but then again, who would have believed in such a thing as chicory-stealing sous chefs? Wow! I am relieved to know that you live in Vancouver. Exactly! We just have houses with plastic animals on the roof. Nobody’s up there on a ladder trying to steal them. Amen, Mark! Because the crime here in Philly is HORRENDOUS. And hey, we have one of those “Man with an umbrella” statues in Philly as well. In fact, speaking of violence, several years ago when the Phillies won the World Series, several Phillie fans vandalized that statue by turning it over on the sidewalk and damaged it severely. See, what did I tell ya…the crime and violence in Philly is horrendous. And that’s even when they WIN something. So yes, keep Portland weird because at least it’s happy state. I knew sous chefs were an unseemly bunch. Thanks for the frightening confirmation. Thanks God I live in Ecuador, where crime is much more routine–not nearly as weird as Portland’s. It’s probably much more routine just about any place you’ll go! What IS the crime rate like down there, out of curiosity? Cuenca strikes me as a pretty safe place. Impressive vagabonds, Sir. I read about your crazed sous-chefs and sweater stealers, and…I like it. I think they’re all kind of hilarious. When I first heard about the sous chefs, I had to double-check to make sure I wasn’t reading an article out of The Onion! If this is the worst you have to contend with I would be happy! Keep it weird! But what about the poor pineapple weed owners whose valuable crop keeps disappearing?!? !